You are here: Home / People on the Way to Occupy D.C.
People from all over the country are heading to Washington,D.C. this week. A bit further on Idiscuss meeting with three of them heading across country to Occupy DC. October 6th marks the 10thanniversary of the invasion and occupation of Afghanistan. Ten years ago we were mourning theattacks on New York City, the District of Columbia, and one attack that wasthwarted and became a crash site in Pennsylvania. We had the world on our side, our country was more unitedthan we had been in decades, and our finances were in good shape. 10 years later the American people seem to be awakening toan understanding that they have been lied to, manipulated and bankrupted inorder to benefit the wealthy corporate and military interests that used anattack on U.S. soil to corrupt the democratic processes that regulatecapitalist maximization of profit at the expense of human needs. October 2011 isthe 10th anniversary of the invasion of Afghanistan and the beginning of the2012 federal austerity budget. It is time to light the spark that sets off atrue democratic, nonviolent transition to a world in which people are freed tocreate just and sustainable solutions. During the evening of September 29th I had the opportunity to talk to Xan,Peter, and Kevyn as they camethrough Tucson on a caravan across the southern United States that was stoppingin as many places along the way as people want them to talk about the issues orto join in a vigil or protest, or join with the caravan and go to D.C. to jointhe Human Need Not Corporate Greed occupation force there. The three original caravan members, others may have joined along theway by now, are associated with peace groups, Xan and Kevyn identify withCodePINK, and Peter is a member of Veterans for Peace. 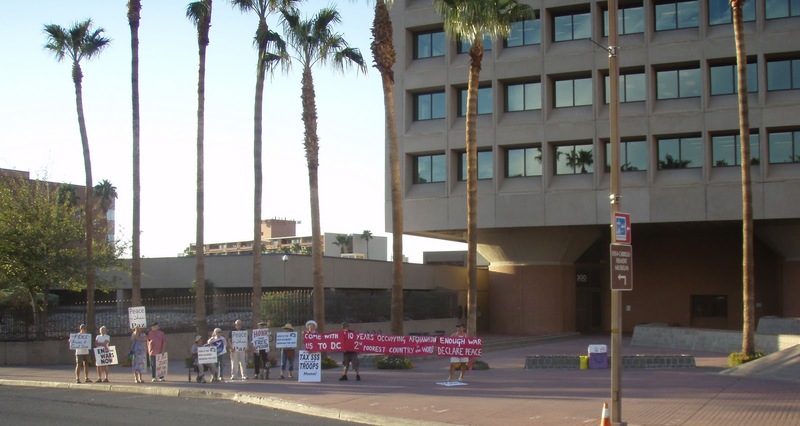 Their stay in Tucson included protest with the local peace and justicecommunity at weekly gathering in front of the Federal Building in downtownTucson at rush hour, a candlelight vigil for DRONE victims in front of thegates of Davis Monthan Air Force Base at sunset, connection with another weekly vigil for those migrants who die in thesurrounding desert nearly every week of the year in the northern reaches of theSonoran Desert. 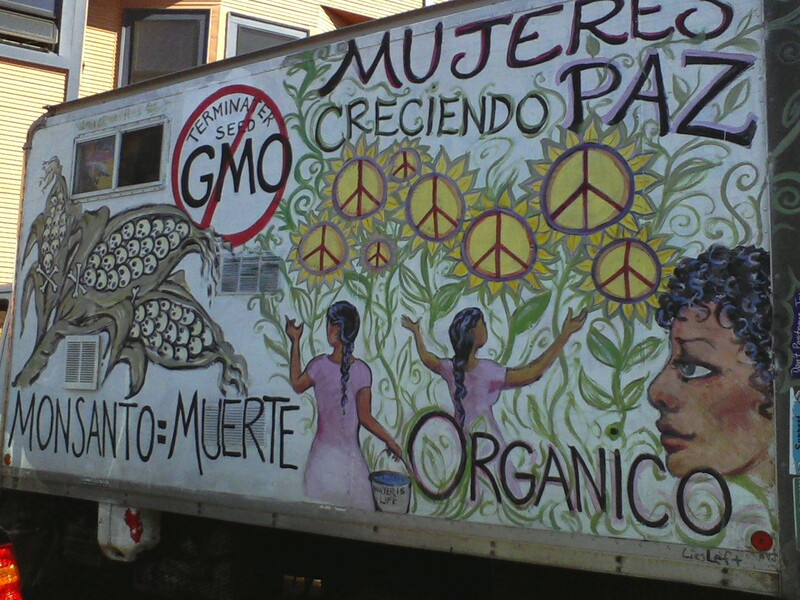 Then with theTheater’s permission the lead Caravan Truck parked in front of the main theaterdoors with the with the side with the beautiful mural painted by Phoebe Ackley so that viewers of aprivately sponsored viewing of The Future of Food organized by the Tucson GMO FreeGroup could see thatindividuals from diverse groups have the same concerns and can spread amessage, have impact, and talk to caravan members about the overlapping goals and agendas of peace andsafe food groups. The concept of overlapping concerns and goals is a growing theme inU.S. civic action. Talking heads,such as DylanRatigan on MSNBC today noted the amorphous nature of the reasons for theOccupy Wall Street actions in NYC that are spreading to other major citiesacross the United States. The October 2011 web site that is theoverarching informational site about the occupation of Freedom Plaza in D.C.has a list of 15 Core Issuesof the Human Needs Not Corporate Greed actionsin D.C.
People’s motivations and wellbeing, as well as the ideal of democracyare complex constructs and cannot be condensed into the well-packaged marketingsound bytes easily broadcast by our media that now functions as much from pressreleases as from investigative journalism. If the media, even those very few media outlets that arecovering the Human Needs movement, does not understand what certainly seemslike parts of a mass movement reacting to corporate take over of governmentfunctions around the world, well perhaps they will have to revert to old fashionedjournalistic practice. 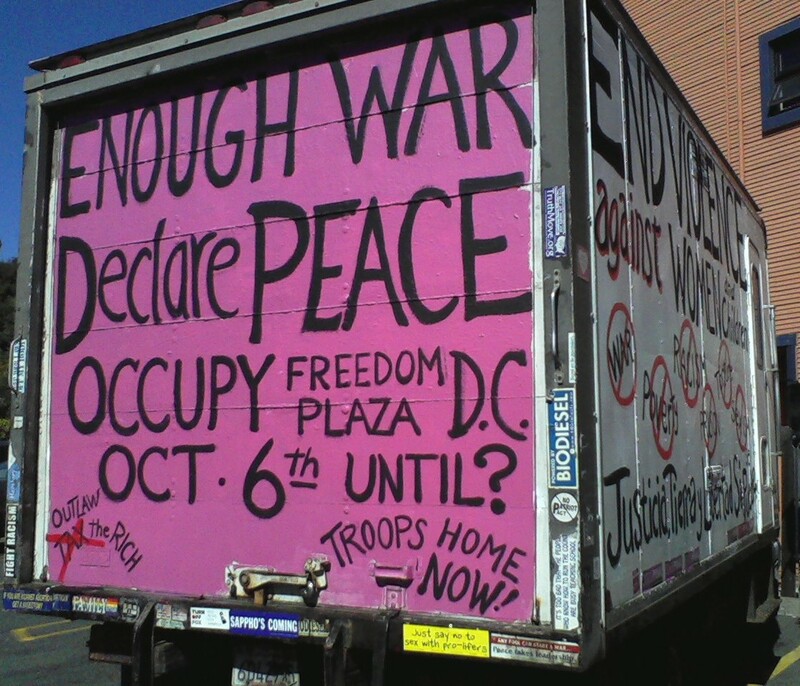 Xan has kept a blog of her activities at CODEPINK Journals since2003. She has made many crosscountry trips from her home in Berkeley to Washington, D.C. and wasinstrumental in getting the first on-going, long-term CODEPINK presence fromall over the U.S. established in D.C. in 2006 and again in 2007 which lead toover two years of constant action in the Halls of Congress by women who camefrom every part of the U.S. to stay for a week or a month and focus on actionspertinent to them and the areas of the country from which they came at The PinkHouse, a cooperatively run house near Capitol Hill. A core group of activists and groups have promoted various views of and solutions to themisuse of government. and the peoples wishes and funds, over the last 10years. Without them the current,extremely diverse 99 Percentmight not be able to move in synch in what now seems to be a an organic trajectoryrather than a single minded group. Just like the Caravan built on already occurring events in the local community, what is building in the U.S. builds on years, and indeed years of awareness of the growth of greed. Thisis the stuff of which revolutions are made. I think the people of the United States had their revolutionand now they want it back. Democracyis powerful and it is far more than a memory to the American People. I can provide contact information tointerested independent journalist bloggers who wish to request an interviewwith one or more of the caravan participants. "I pledge that if any U.S. troops, contractors,or mercenaries remain in Afghanistan on Thursday, October 6, 2011, as thatoccupation goes into its 11th year, I will commit to being in Freedom Plaza inWashington, D.C., with others on that day or the days immediately following,for as long as I can, with the intention of making it our Tahrir Square, Cairo,our Madison, Wisconsin, where we will NONVIOLENTLY resist the corporate machineby occupying Freedom Plaza to demand that America's resources be invested inhuman needs and environmental protection instead of war and exploitation. Wecan do this together. 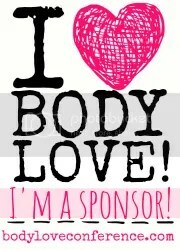 We will be the beginning." A core group of activists and groups have promoted various views of themisuse of government and the peoples wishes and fund over the last 10years. Without them the currentextremely diverse 99 Percentmight not be moving in synch in what now seems to be a an organic trajectoryrather than a cohesive group. Thisis the stuff of which revolutions are made. I think the people of the United States had their revolutionand now they want it back. Democracyis powerful and it is more than a memory. This piece is cross-posted at my political blog. I can provide contact information tointerested independent journalist bloggers who wish to request an interviewwith one or more of the caravan participants.